Tomorrow is April 22, Earth Day. Celebrate Mother Earth with your little ones and teach them the importance of appreciating and nurturing our beautiful planet with these fun ideas for an Earth Day play date. Set up a craft station with old newspapers and magazines, empty paper towel and toilet paper rolls, plastic bottles, and any other recyclable you have lying around, toss in some glitter, glue, markers, string, and safety scissors, and let little ones use their imaginations to create works of art. Pick up mason jars (or any open top container) from the grocery or craft store and make terrariums. Here's a great how-to video that shows the simple steps. Go on a hike, walk through a botanical garden, visit a body of water...there is so much Earth to explore and appreciate. Take notepads and pencils to jot down the the sights and sounds of the great outdoors. Pull out your craft supplies and get to work on a plain, canvas tote bag (you can usually find one at craft or fabric stores). 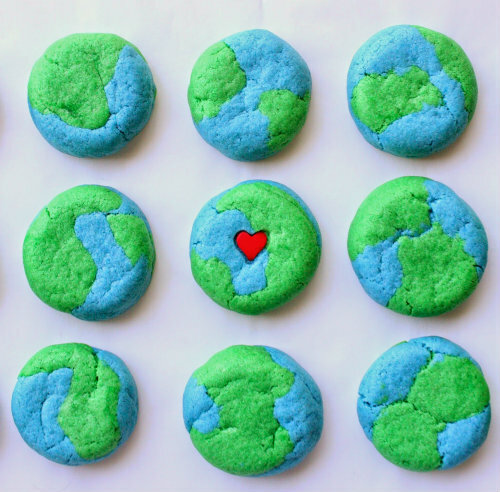 And since it's easy to work up an appetite while being kind to the earth, finish your day with the Earth Day cookies pictured above. Earth Day cookies look like so much fun! The littles would love these. Thanks for the ideas! I know! My girls will love making these.